Posted 4:43 pm by Administrator & filed under News. 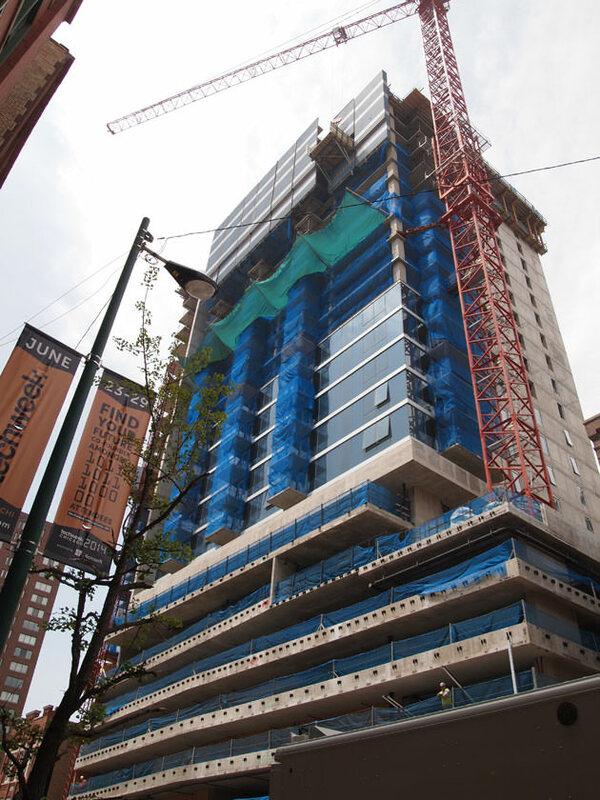 Jones Chicago, a 25-story apartment tower under construction in Chicago’s River North neighborhood, has topped out. The 278,000 SF high-rise will house 188 luxury apartments, structured parking for 154 vehicles and 1,500 of ground-level retail space. Located at 220 W. Illinois Street, Jones Chicago is within close proximity to Merchandise Mart, art galleries and restaurants. HPA was retained as architect and interior designer by Gerding Edlen, a Portland-based full-service real estate firm known for developing and managing green buildings. The project scope also included rehabilitation of an adjacent landmark Chicago Firehouse, which will be adaptively reused for commercial use. The tower has an efficient concrete structure enclosed by a hybrid window-wall system and concrete panels applied in a randomized pattern. Metal patterns that conceal the parking deck are perforated with a whimsical pattern derived from architectural details from the historic firehouse. Studio, one- and two-bedroom units feature exposed concrete structure, floor-to-ceiling windows and private balconies. Residents will have in-unit thermal control via Nest thermostats. Amenity spaces are arranged throughout the building to foster community while serving individual resident needs. Communal areas include a rooftop terrace with pool deck, dog run, conference room, fitness center, and expansive rooftop lounge with an exhibition kitchen and pool table. Targeting LEED Gold certification, the building’s sustainable design incorporates a high-performing building envelope and mechanical system, a green roof, and recycled and local products. The project is scheduled for initial occupancy in Fall 2014, with full completion by Spring 2015.